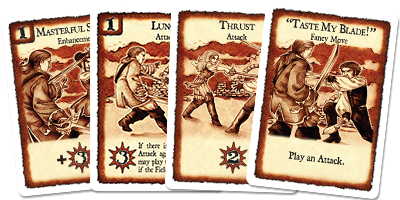 En Garde Reforged is a reboot of our 2005 cinematic action card game. 2-6 impeccably dressed Renaissance-era duelists engaged in a pitched clifftop melee. Players must attempt to out maneuver their opponents in a series of one on one duels to prove their technique reigns supreme. Carefully manage your cards and keep calm, cool and collected if you hope to win the day. If you’re attacked at the wrong moment, prepare to taste cold steel!